Bradycardia and conduction defects, such as bundle branch block, fascicular block and AV block, are common in myocardial ischemia and infarction. These conditions may be seen as signs of ischemia, which is why one must be familiar with them. In order to completely understand the different complications related to ischemia/infarction in the conduction system, one must be familiar with the vascular supply to these components. Figure 1 presents all relevant parts of the conduction system and their source of blood supply. Figure 1. The component of the cardiac conduction system and the vascular supply. RCA = right coronary artery. LAD = Left anterior descending coronary artery. LCX = left circumflex coronary artery. 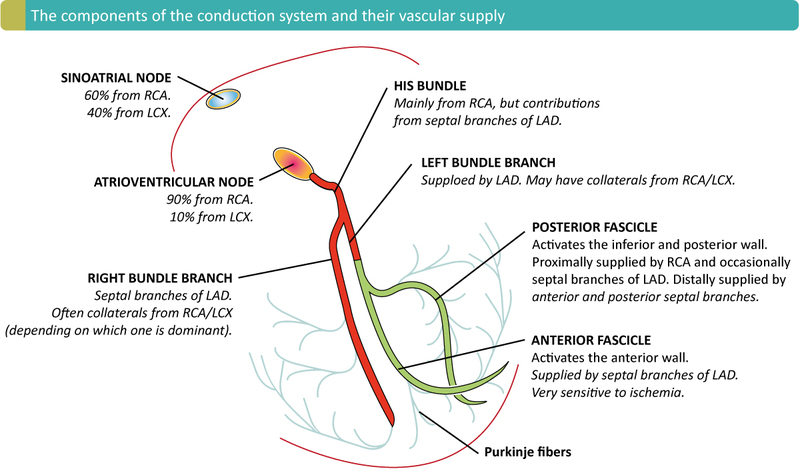 Figure 1 presents the components of the conduction system and the arterial blood supply. The first third of the right bundle branch run in the endocardium, near the ventricular cavity, and it may to some extent receive oxygen from the blood in the ventricular cavity. The right bundle branch then runs deeper into the myocardium, where roughly one third of its length is located. It then runs closer to the endocardium, again, in its final third. The right bundle branch does not give off any Purkinje fibers during its course through the interventricular septum. It starts to branch off at the anterior papillary muscle’s origin. The interventricular septum obtains Purkinje fibers from the left bundle branch. The coronary artery that supplies the PDA (posterior descending coronary artery), which supplies the inferior wall of the left ventricle, determines the coronary artery dominance. A right-dominant system implies that the PDA is supplied by the right coronary artery (RCA). A left-dominant system implies that the PDA is supplied by the left circumflex coronary artery (LCX). Right-dominant system is by far the most common anatomy, occurring in 90% of all individuals. Figure 2. 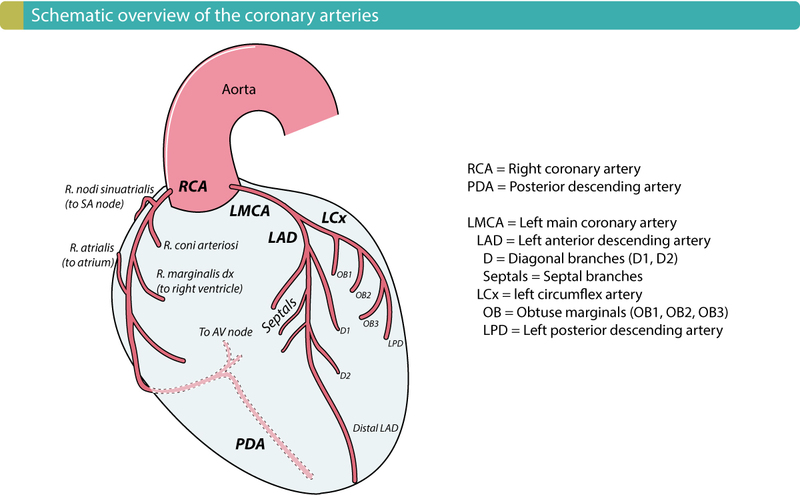 Coronary arteries in a right-dominant system. Bundle branch blocks may be caused by ischemia/infarction. A new bundle branch block in a patient presenting with chest discomfort is strongly suggestive of ongoing ischemia/infarction. Among all patients with acute myocardial infarction the prevalence of right and left bundle branch block on arrival ECG is 6% and 7%, respectively. A proportion of these patients have a new bundle branch block, which in the case of left bundle branch block should lead the clinician to activate the catheterization laboratory (discussed in Left bundle branch block and ischemia/infarction). Studies demonstrate that individuals with acute myocardial infarction who do not display bundle branch block on the arrival ECG, will in most cases not develop bundle branch block during the hospital stay. As discussed previously, the presence of bundle branch blocks renders ischemia interpretation more difficult, which explains why individuals with bundle branch blocks are treated sub-optimally (in terms of evidence based medications and use of PCI), as compared with individuals without bundle branch blocks. Moreover, individuals with bundle branch block have poorer survival than their counterparts with intact bundle branches. Individuals with ischemic heart disease (or myocardial infarction) who present with right bundle branch block typically also have a fascicular block. This condition is referred to as bifascicular block. The anterior fascicle is most likely to be defect because it is most sensitive to myocardial ischemia. Note that isolated fascicular blocks are uncommon in acute myocardial infarction. Left bundle branch block and ischemia/infarction has been discussed previously. The right bundle branch block mainly affects the terminal portion of the QRS complex, resulting in a second R-wave (referred to as R’) in V1–V3 and a broad and deep S-wave in V5–V6. However, right bundle branch block only affects the depolarization of the right ventricle; the left ventricle will be depolarized, which is why infarct criteria for the QRS complex (pathological Q-waves) may be applied in the presence of right bundle branch block. The right bundle branch block will also cause secondary ST-T changes in lead V1–V3 but these forces are not strong enough to mask ischemic ST-T changes arising from the left ventricle (because it has stronger electrical potentials). The classical ECG changes (and ECG criteria) seen in STE-ACS/STEMI and NSTE-ACS/NSTEMI do apply in presence of right bundle branch block. To conclude, ECG interpretation of ischemia may proceed as usual in presence of right bundle branch block. One should also be observant regarding pseudonormalization of T-wave inversions (i.e finding that known T-wave inversions have become “normal”). This is a sign of ischemia if it occurs in V1–V3. As mentioned above, right bundle branch block is often accompanied by a fascicular block. In the vast majority of cases it is the anterior fascicle that is defect in ischemia/infarction. This yields Q-waves in V2–V3, but these Q-waves are usually small and do not reach criteria for pathological Q-waves. Interestingly, Widimsky et al (European Heart Journal, 2014) reported that new right bundle branch block (with or without fascicular block) may be as strong a predictor of acute occlusion as is left bundle branch block. They also demonstrated that in-hospital mortality for patients with new right bundle branch block was at least on a par with patients with new left bundle branch block. The authors suggested that new right bundle branch block should be given the same significance as new left bundle branch block. These conduction defects arise in ischemia/infarction due to imbalance in the autonomic nervous system (temporary autonomic dysfunction is common in myocardial infarction) or as a direct consequence of ischemia/infarction. Importantly, conduction defects caused by inferior wall ischemia/infarction are transient in the vast majority of cases, whereas conduction defects due to anterior wall infarction tend to be permanent. There are no data on differences in the incidence of these conduction defects in NSTE-ACS/NSTEMI and STE-ACS/STEMI. However, approximately 7% of patients with NSTE-ACS/NSTEMI develop high-degree AV-block (second-degree AV-block or higher). Conduction defects may arise anywhere between the onset of ischemia until a few days after completion of the infarction. Sinus bradycardia occur in up to 40% of patients with inferior wall myocardial ischemia/infarction. AV blocks are also common. Both sinus bradycardia and AV-blocks are usually caused by autonomic imbalance, more precisely increased vagal tone. This phenomenon only occurs in inferior wall ischemia/infarction. Importantly, sinus bradycardia and AV-block due to increased vagal tone is reversible and usually resolves within a week. Administration of atropine will increase the heart rate (i.e inferior wall ischemia/infarction is sensitive to atropine). AV blocks may also be caused by edema or accumulation of adenosine in the AV-system. This type of AV-block usually occurs sub-acutely (after 24 hours) and also resolves spontaneously. It is typical that this type of AV block display a gradual normalization from third-degree AV block to second-degree to first-degree and finally to normal AV conduction. This type of AV block, however, is not sensitive to atropine. High-degree AV block (second-degree AV-block type 2 or third-degree AV-block) occurs in 10% of patients with inferior ischemia/infarction. The conduction defect is usually located in the AV node, which means that an escape rhythm usually arises distal to the defect. Escape rhythms generated proximal to the bifurcation of the His bundle will have normal QRS complex (QRS duration <0.12 s), whereas those arising distal to the bifurcation will have wide QRS complexes. AV blocks in inferior wall ischemia/infarction rarely cause circulatory compromise (unless the ejection fraction is not markedly reduced). Moreover, the vast majority of AV blocks due to inferior wall ischemia/infarction resolve spontaneously within a week. Sinus bradycardia The most common complications. Affects up to 40% of cases. Caused by increased vagal tone and is therefore transient. Sinus node dysfunction Less common. May be seen in the sub-acute phase (>24 hours) Mostly permanent. First-degree AV-block Common Majority resolves within 1 week. Second-degree AV-block, Mobitz type 1 (Wenckebach block) Relatively common. Majority resolves within 1 week. Second-degree AV-block, Mobitz type 2 Uncommon. Mobitz type II is more common in anterior wall ischemia/infarction. Majority resolves within 1 week. Third-degree AV-block Common (10% of inferior wall ischemia/infarctions). Usually caused by intranodal defect. 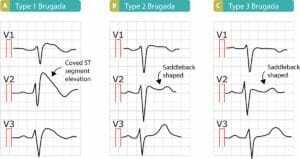 Evolves gradually from 1st, to 2nd to 3rd degree block, which culminates with asymptomatic bradycardia. Much less common in anterior wall ischemia/infarction (prevalence 3%). Majority resolves within 1 week. Conduction defects caused by anterior wall infarction are caused by necrosis and thus not reversible. The cause is almost invariably occlusion in the LAD (left anterior descending coronary artery) resulting in necrosis of the interventricular septum. AV blocks in anterior infarction are due to necrosis in the bundle of His, which is why any escape rhythm usually has wide QRS complexes (most often with right bundle branch pattern). Prolonged PR interval is very common. Second-degree AV-blocks in anterior infarction are usually Mobitz type II. Extensive septal necrosis may result in third-degree AV-block. Development of third-degree AV-block is typically preceded by a new right bundle branch block with left or right axis deviation. This should alert the clinician to the risk of third-degree AV-block. The right bundle branch block caused by septal infarction is usually associated with Q-wave in V1 (QR complex). Because the right bundle branch and the anterior fascicle both obtain blood supply from the proximal septal branches of LAD, it is common with the combination of right bundle branch block and anterior fascicular block (i.e bifascicular block) in anterior wall infarction. The combination of right bundle branch block and posterior fascicular block is much less common. Notably, bifascicular block markedly increases the risk of third-degree AV-block. The risk is especially high if there is simultaneous first-degree AV-block (this is often referred to as trifascicular block); artificial pacemaker will mostly be needed in that scenario. Anterior wall infarctions with third-degree AV-block are associated with very high mortality. Some studies have reported up to 80% mortality rate.